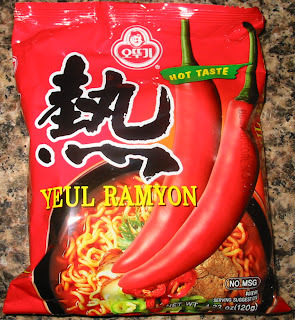 Yeul Ramyon is a Korean instant noodle made by Ottogi Ramyon, the manufacturer of Jin Ramyon. Yeul Ramyon has many of the typical characteristics of Korean ramen. 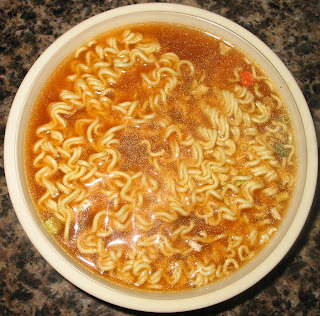 It comes in a large package (120g), the noodles are thick and chewy and the broth is spicy. I really don't know how this pack is supposed to differ from the Jin Ramyon Spicy Taste, but I guess that this one does not have any beef flavoring in the broth. These noodles were nothing unusual but were still pretty good. The noodles were thick and chewy like most Korean noodles. There were plenty of mushrooms, scallions and carrots which added some nice bursts of flavor. The soup broth tasted a bit peppery and was not very spicy compared to most Korean ramen. I enjoyed this ramen but felt that it tasted exactly like Jin Ramyon Hot Taste and most other Korean instant noodles. To be honest, next time I would just buy whatever spicy Korean ramen was on sale the most at the local Asian grocery store. They are all about the same and all pretty good. 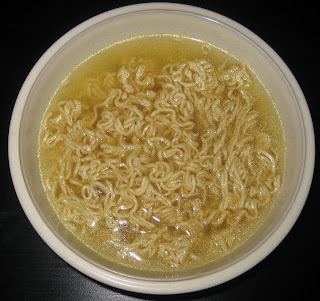 What happens if you take away all flavorings from a broth except for Monosodium Glutamate? 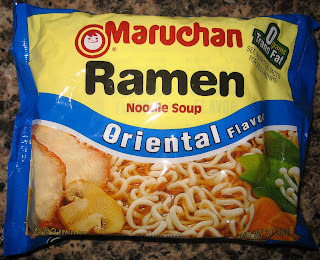 You slap the "Oriental Flavor" label on it and watch as the profits roll in! Although I'm not sure how high Maruchan's profit margins can be since these packs are on sale for 12 cents at Ralph's. The broth in these noodles tastes surprisingly good. There really is no flavor here aside from umami, but umami is delicious. Still, I decided to add some Sriracha sauce since the flavor was still quite simple and needed a little more complexity. This pack of noodles is about as basic as you can get. The noodles are pretty low quality and the broth consists of just MSG flavored soup. It doesn't taste bad at all, but it just doesn't have the complexity and flavor that I usually prefer out of my instant noodles. Still, you can't ask for much more than this for only 12 cents. 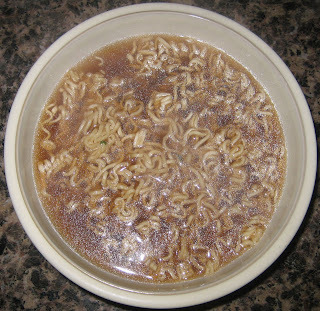 Maruchan is not afraid of saturating their soups with Monosodium Glutamate, better known as MSG. This chemical has been subject to much controversy which I won't get into now. 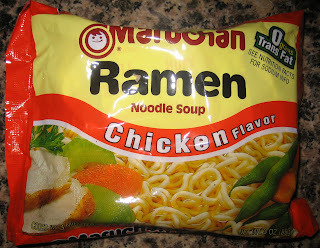 All Maruchan noodles do have the unmistakable taste of Umami, which I like to call the 5th taste. It's extremely difficult to describe what umami tastes like. I guess it's sort of like the difficulty in explaining the taste of sweet or salty. This broth tastes strongly of umami, although there is a bit of chicken flavor that tastes like it came from a bouillon cube. I won't complain about the Maruchan noodles here because I have done plenty of that already in previous posts. The flavor of this broth is quite pleasant from the MSG, but I still felt that it lacked interestingness. So, I added a big dose of Sriracha sauce to liven up the flavor. Sriracha sauce goes very well with umami flavored broths; that's why you often see it at Vietnamese restaurants where the broth is naturally laden with MSG. I wouldn't particularly recommend this pack of ramen, but it is cheap and inoffensive if that is what you are looking for.